Rosary bracelets are handmade with Gemstones, antique reproduction bronze miraculous medals, and bronze crucifix charm. 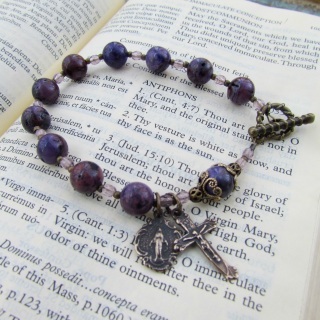 I make rosary bracelets for men and women. 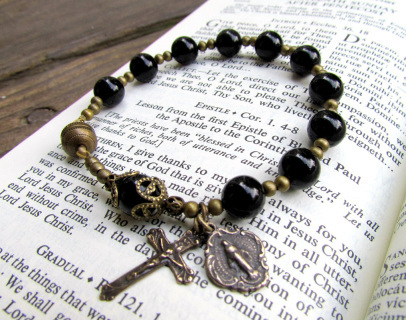 A rosary bracelet makes a beautiful and affordable gift! Click on one of the two styles of construction: The Beaded Rosary bracelets are made with Flexible stainless steel wire, and the Heirloom Rosary bracelets are hand-turned with solid wire construction. A rosary bracelet made with deep Purple Crazy Lace Agate gemstones. The size in the photo is 7.5" (average size for women) but I can make this in any length (7-9"). Measure your wrist and add 1 inch to find your best length. 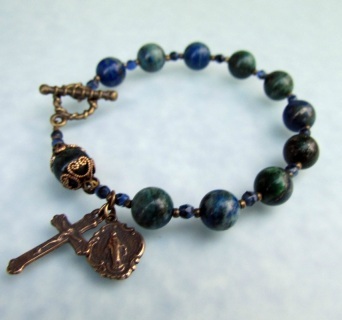 This rosary bracelet is made with 8mm Azurite Lapis Lazuli gemstone beads for the Hail Mary beads and Our Father bead. The crucifix and miraculous metal are beautifully detailed. They are solid bronze, hand cast from antique pieces. The bracelet is strung on Jewelers wire---49 strand of stainless steel that is nylon coated. It has a 26lb tensile strength and is very strong. 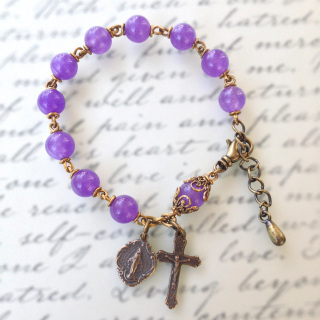 This beautiful semi-precious gemstone bracelet is also a one decade rosary. The Hail Marys are Red Tigereye gemstones, as is the Our Father bead.The crucifix and miraculous metal are beautifully detailed. They are solid bronze, hand cast from antique pieces. The bracelet is 7 1/2" long. To find your bracelet length, measure your wrist and add 1 inch. Contact me for free adjustment. This bracelet is available. There are natural variations in the beads from those pictured. I make every attempt to make it as similar as possible..
A rosary bracelet made for men with Black onyx, bronze medals, and bronze beads. Photo will soon be changed to a Toggle Clasp. The bracelet with magnet is sold out. Feel free to order the lobster claw clasp instead. Just make a note of it in checkout. Larger sizes will be made in the design picture below this one. 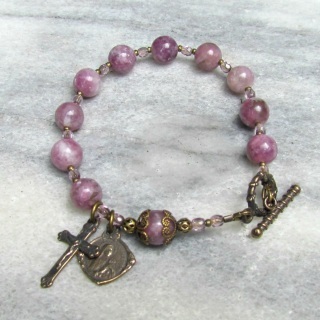 St Therese Medal Rosary Bracelet with Pink Lepidolite gemstones. 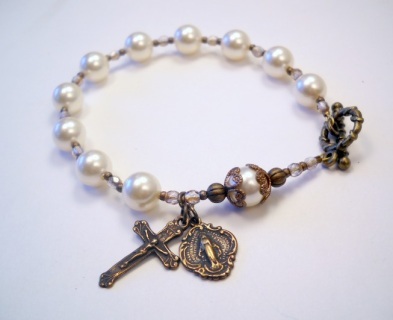 This St Therese of Liseux medal is an antique reproduction which gives this rosary bracelet vintage charm. The front of the medal says St. Therese of Liseux. The back of the medal says,"Je veux passer mon ciel a faire du bien a sur la Terre". Which translate to "I will spend my heaven doing good on Earth." The bracelet is secured with a antiqued solid brass toggle clasp that is a perfect size for the bracelet and stays put better than other toggle clasps of larger size. The bracelet is strung on Stainless Steel Flexible Jewelers wire---49 strand of stainless steel that is nylon coated. It is finished with a bronze plated toggle clasp. 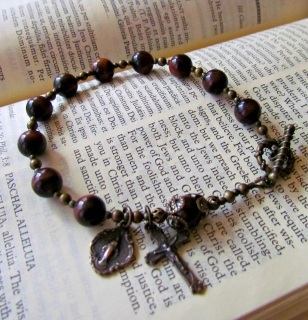 This Rosary Bracelet measures 7 1/2" long. To Find your rosary bracelet size: Take your wrist measurement + 1 inch. If you need me to adjust the size for you, just contact me . 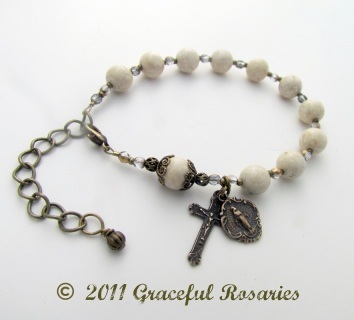 For the lady with the tiny wrist I have adapted my rosary bracelet design to a 6 1/2" length. The beads are the same size as the other bracelets but I use fewer spacer beads. The Bracelet in this photo is Blue Crazy Lace Agate. The medals are Solid Bronze antique reproductions. I can make this same length for any of my rosary gemstones. Just contact me to custom order your small size bracelet. 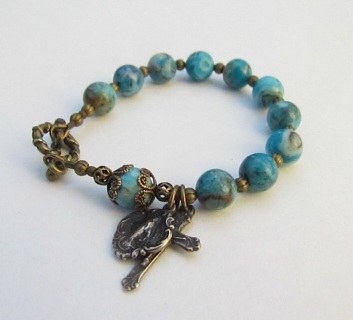 This rosary bracelet is made with 8mm Riverstone gemstone beads for the Hail Mary beads and Our Father bead. The crucifix and miraculous metal are beautifully detailed. They are solid bronze, hand cast from antique pieces. The bead caps, lobster claw and extender chain are antiqued brass. The bracelet adjust from a 6 3/4" size to an 8 1/2" size. This beautiful semi-precious gemstone bracelet is also a one decade rosary. 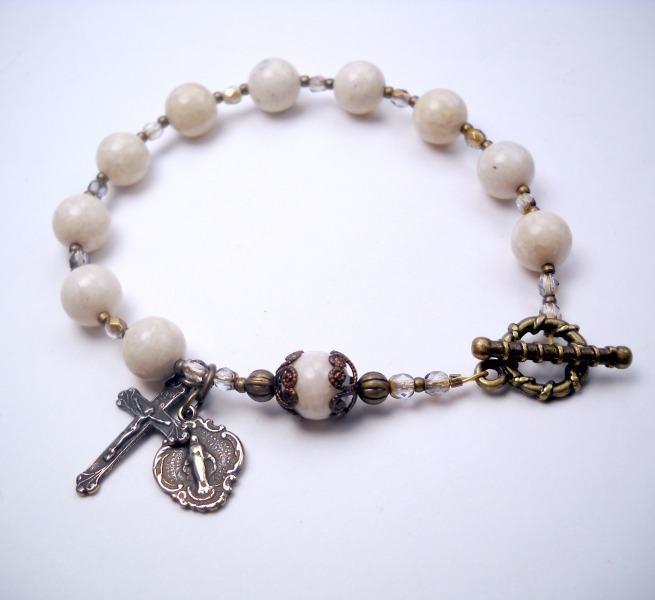 The Hail Marys are White Riverstone gemstones, as is the Our Father bead. The bracelet is 7 1/2" long. To find your bracelet length, measure your wrist and add 1 inch. 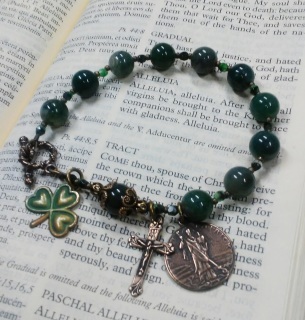 This rosary bracelet is made with 8mm Moss Agate Gemstones for the Hail Mary beads and Our Father bead. The crucifix and St Patrick medal are beautifully detailed. They are solid bronze, hand cast from antique pieces. The bead caps, lobster claw and extender chain are antiqued brass. There is no plating of metal on this bracelet. The patinas are natural. The bracelet measures 7.5 inches and can also be made in a custom length. STERLING Silver: All bracelets are also available by custom order in Sterling Silver. The Cost is $58.00 for the sterling silver Beaded bracelet in the style above. Contact me for cost of Heirloom Construction. Contact me with your choice of stone and bracelet length (measure your wrist and add 1 inch). Click here to see more heirloom bracelet designs.